Scrambling to get everyone the perfect gift? 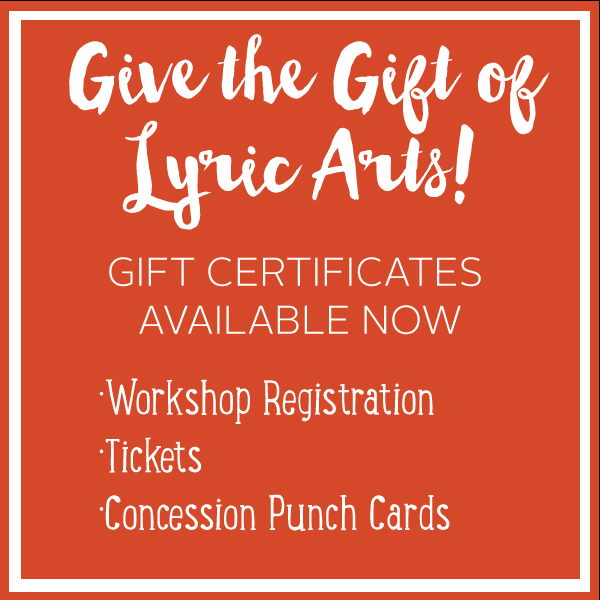 Look no further than Lyric Arts' gift guide! Is there a musical fan in your family? Treat them to a four-show package. This package will guarantee them seats to four different shows. Give them this gift just in time for them to see musical favorites such as She Loves Me and Guys and Dolls, and some of our plays, Superior Donuts, You Can't Take It With You, A Wrinkle in Time, or Steel Magnolias. For the personal touch, feel free to stop into our box office or call at 763.422.1838. Gift certificates are the perfect gift for anyone in your family! Your loved one can use this certificate for any show, workshop, or event. The best part of the package is that this certificate can never expire! If you are looking for the perfect gift for your theater-aspiring child or grandchild, look no further! Lyric Arts provides classes for all age groups. Encourage their love of the arts by signing them up for a fun class! Treat your friends and family to a warm cup of coffee or their favorite snack while they enjoy a show! Have a night out with your theater guru! Honor a loved one with a tax-deductible donation in their name. Lyric Arts is supported by patrons, and donors are honored in our theater programs.